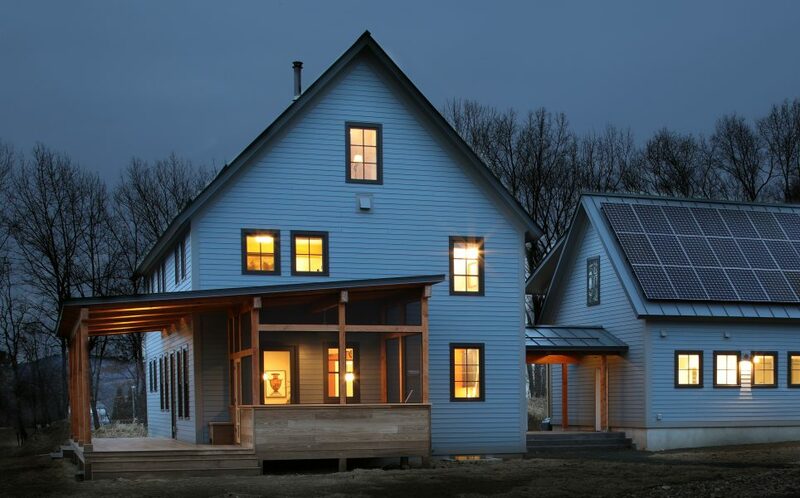 This high-performance homestead is nestled between farmland and neighborhood, an example of the growing movement to bridge the gap between residential and agricultural landscapes. The double-stud R-40 wall assembly and double-rafter R-60 roof assembly are vented to the exterior, providing a super-insulated shell with durable drying potential. With diligent blower-door testing, the project team obtained an air tightness reading of 0.05 CFM/SF shell at 50 pascals, meeting the Passive House standard. The HVAC systems include air-sourced heat pump (ASHP), energy recovery ventilation (ERV), and an on-site SunPower 360 module (10.8 kW) power generator. 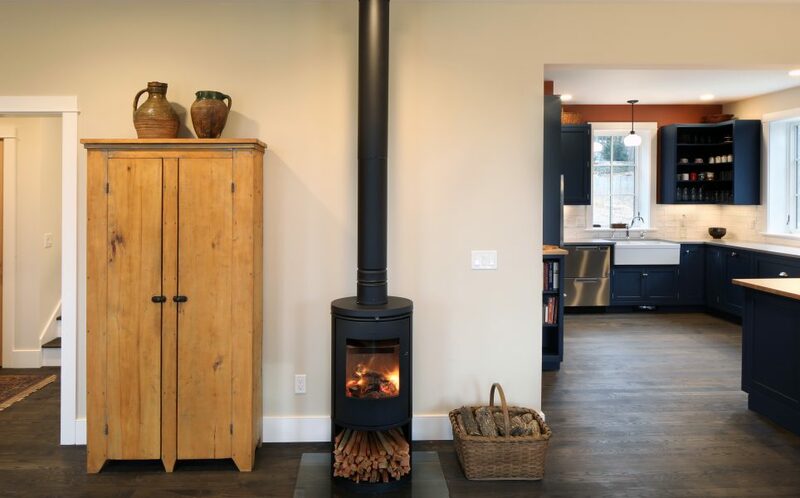 A high efficiency convective wood stove with outdoor combustion air ducted directly to the firebox offers additional comfort and a measure of energy resilience. Generous circulation lets in light and creates versatile, functional spaces. 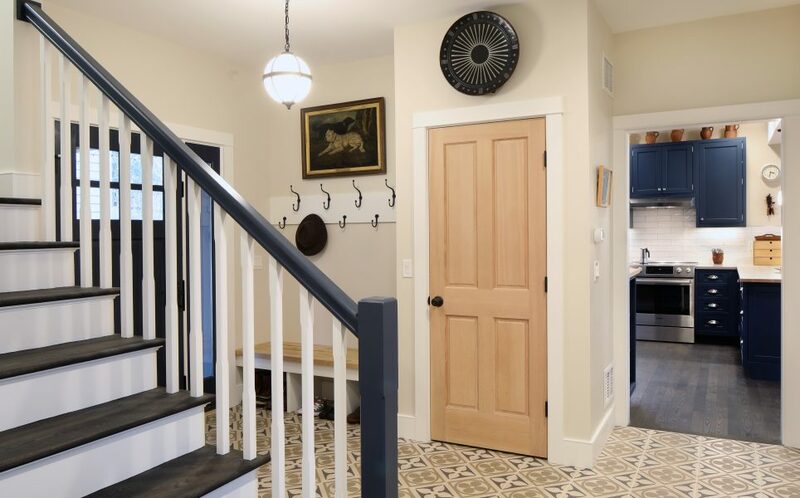 A simple stair and hallway expand to incorporate additional areas: sitting & library spaces, pantry shelves, a mudroom and formal entry that connect to the breezeway and garage. 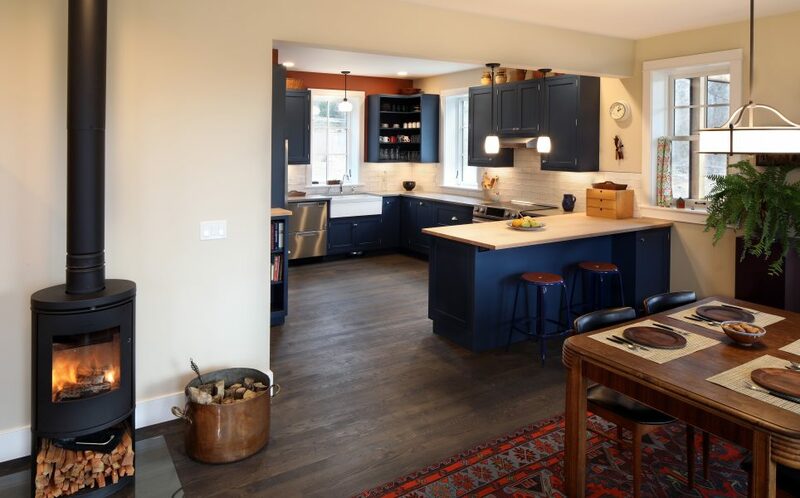 There is plenty of room for books, canned goods, boots, coats, gear, and a protected place to sit on the stoop — all in near proximity to a spacious farmhouse kitchen and screened-in porch. 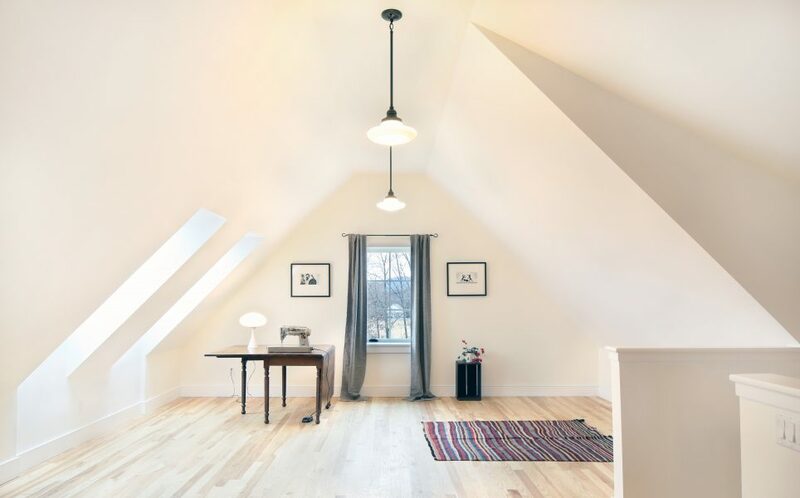 The home utilizes both attic and basement, and incorporates a stacked studio apartment and bike shop, maximizing the usable space on the footprint. A covered porch serves the second-floor apartment as a protected entry and outdoor seating space. 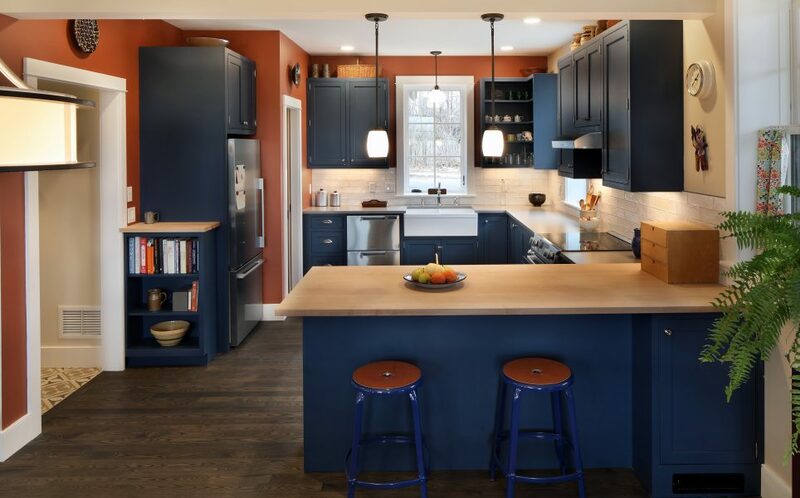 The project hosts 4,400 sf of conditioned living space and an additional 3,100 sf of usable indoor and outdoor spaces in a modest footprint under 3,000 sf. The indoor-outdoor connection is delivered by a traditional layout of triple-glazed windows and doors. Transitions in and out of the home are made fluid in their materiality – textured concrete leading to tile at the entry and thermally modified ash leading to a dark oil-stained ash within. Deep sills celebrate the super-insulated walls and a series of window wells allow natural light into a basement laundry, shop, storage, and mechanical room. 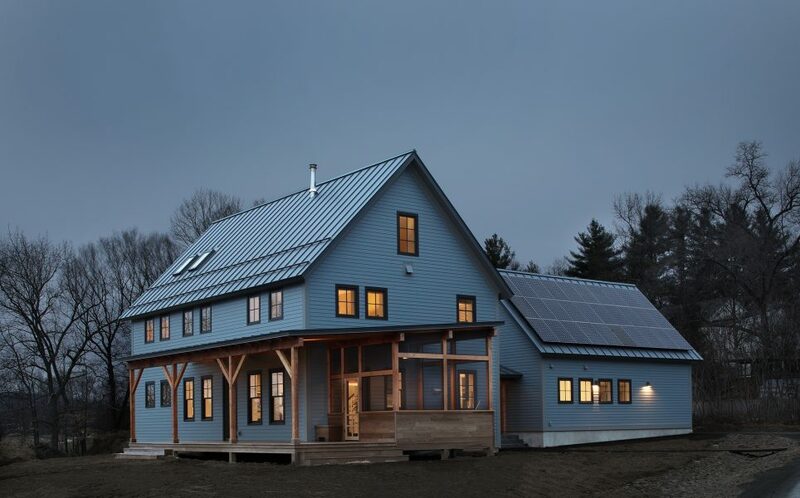 Using the vernacular form of the New England farm buildings, coupled with an exceptional envelope, a net-zero-capable farmstead begins. An engaged client and thoughtful local builder made this an enjoyable project with excellent results.